I lost my hero today. At the age of 66, the literary world has lost one of its best and brightest, Sir Terry Pratchett, to the “embuggerance” of Posterior Cortical Atrophy. He was not only one of my favourite writers, but one of those who inspired me to write and to become the best I could be. Discworld was my crash-course in fantasy literature and the influence, not just on my reading preferences but on my writing, has been enormous. Like many fans, although I was saddened by the Alzheimer’s announcement, I also felt that the way Sir Terry dealt with his diagnosis and his resulting documentaries, Living with Alzheimer’s and Choosing to Die, were not only very brave but brought topics that are often considered taboo into public discussion. 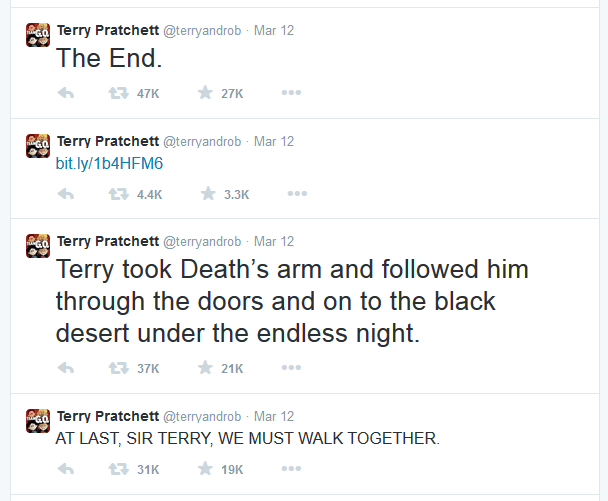 As the man himself said in Going Postal: “Do you not know that a man is not dead while his name is still spoken?” In that sense, Terry Pratchett will live on in his writing for generations to come. Farewell, Sir Terry. It was an honour to have the chance to meet you, to talk to you and to read about the wonderful worlds that lived in your imagination.